Background: Stress is a term used to define factors involved in changes in the physiological balances resulting in disease conditions. Chronic exposure to stress conditions in modern lifestyles has resulted in a group of disorders called lifestyle disorders. Genetic background and environmental factors are interrelated to lifestyle in determining the health status of individuals. Hence, identification of disease-associated genes is the primary step toward explanations of pathogenesis of these diseases. In functional genomics, large-scale molecular and physiological data are used for the identification of causative genes associated with a disease. Aim: The objective of our study was to find a common set of genes involved in chronic stress-related lifestyle diseases such as cardiovascular diseases (CVDs), type 2 diabetes (T2D), hypertension (HTN), and obesity. Materials and Methods: In our study, we have performed a systematic analysis of the functional gene network of four chronic stress-related lifestyle diseases by retrieving genes from published databases. We have tried to systematically construct a functional protein-protein interaction (PPI) network. The goals of establishing this network were the functional enrichment study of interacting partners as well as functional disease ontology annotation (FunDO) of the enriched genes. Results: This study enabled the identification of key genes involved in these stress-related lifestyle diseases by prioritizing candidate genes based on their degree of involvement. In this systematic analysis, we have found key genes for these diseases based on their involvement and association at the gene network level and PPI. Conclusion: We have deciphered a group of genes that in combination play a crucial role and may impact the function of the whole genome in the four lifestyle disorders mentioned. In this study, we have tried to simplify the complexity of the conventional pathway analysis approaches of protein-protein networks or gene network involvement in pathways. 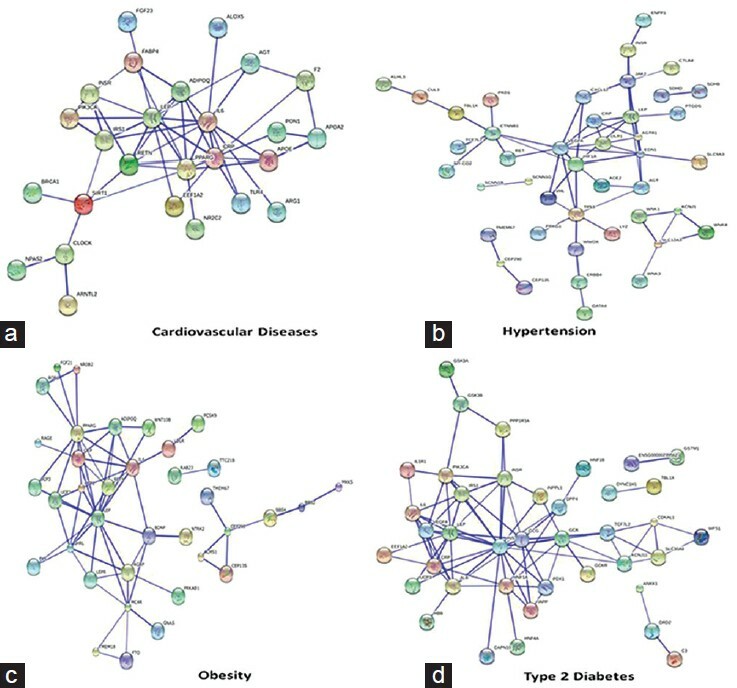 We have tried to correlate the four most common lifestyle and stress-associated disorders (CVDs, T2D, obesity, and HTN) and tried to study their common enriched gene networks based on functionality and interactions. The schematic representation of this study is summarized in Chart 1. In order to build a functional network of the genes involved in four chronic stress-related lifestyle diseases, that is, genes associated with T2D, obesity, HTN, and CVDs were retrieved from the PolySearch database. PolySearch is a comprehensive text mining system that extracts the relationships between diseases, genes, mutations, drugs, and metabolites in humans from different types of biomedical text databases, such as PubMed, OMIM, DrugBank, SwissProt, Human Metabolome Database (HMDB), Human Protein Reference Database (HPRD), and Genetic Association Database (GAD). Searching was performed using "Disease-Gene/Protein Association" as query type and individual disease name, such as "Type 2 diabetes," as the query keywords. Searching for the rest of the diseases was carried out in a similar manner. The obtained gene list was prioritized based on a relevancy score, expressed as a z score [Supplementary 1-4]. In our study we have selected genes having z scores > 1 for further analysis. 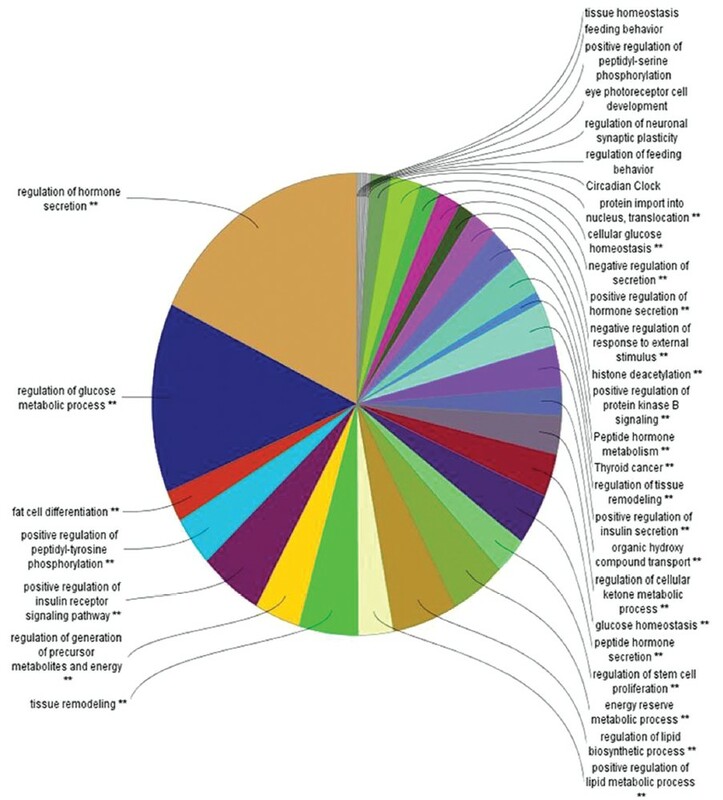 All the genes retrieved from the PolySearch database that were involved in the four chronic stress-related lifestyle diseases under discussion were annotated using FunDO (http://django.nubic.northwestern.edu/fundo). Disease ontology annotations of a human gene describe unique roles for genes in the context of disease and are complementary to gene ontology annotations. This process enabled us to find the relevant diseases with respect to the entered list of genes, based on statistical analysis from the disease ontology annotation database. The genes obtained from the PolySearch database (having z score > 1) were further used for construction of the PPI networks by using the STRING 9.1 (http://string-db.org) database. This database provides known and predicted PPIs from different sources on the basis of their neighborhood, gene fusions, co-occurrence, coexpression, experiments, and literature sources. An extended network was constructed for each individual disease based on a high confidence score ( > 0.7) as selection parameter, which implies that only interactions with high level of confidence were extracted from the database and considered as valid links for the PPI networks. The PPI networks obtained by using STRING 9.1 were analyzed based on topological parameters such as betweenness centrality (BC) and node degree using a Cytoscape (http://www.cytoscape.org) plug-in named "Network Analyzer." In these networks, each gene corresponded to a node and the interaction between the nodes were defined as edges. "Degree" signifies the number of links or edges the node has to the other nodes in a network. The nodes that possess high degree represented the genes having important biological functions. BC reflects the importance of the node based on the number of shortest paths that pass through each node. The network for each disease was visualized based on these parameters, where we mapped the node degree to the node size and betweenness to the node color in the network view. The genes having high BC value and node degree (BC ≥ 0.05 and node degree ≥ 5) for each individual disease were taken into consideration for further analysis. In the present study, after setting up the selection parameter based on the BC values and node degree s (BC ≥ 0.05 and node degree ≥ 5) of the genes involved in these four diseases, functional enrichment analysis was performed using ClueGO. ClueGO, a Cytoscape plug-in, was used to decipher functionally grouped gene ontology and pathway annotation networks. It facilitates the visual interpretation of functionally related genes as a clustered network and chart. The statistical test used for the enrichment analysis was a right-sided hypergeometric test with a Benjamini-Hochberg correction and a kappa score of 0.5 (medium). It enabled us to elucidate the biological functions of the genes, their regulation, their involvement in pathways, and their relevance to diseases. The enriched gene list was obtained using the stringent selection criteria of BC ≥ 0.05 and node degree ≥ 5, and they were further annotated using FunDO. This enabled us to know about the involvement of enriched genes in the top five diseases. 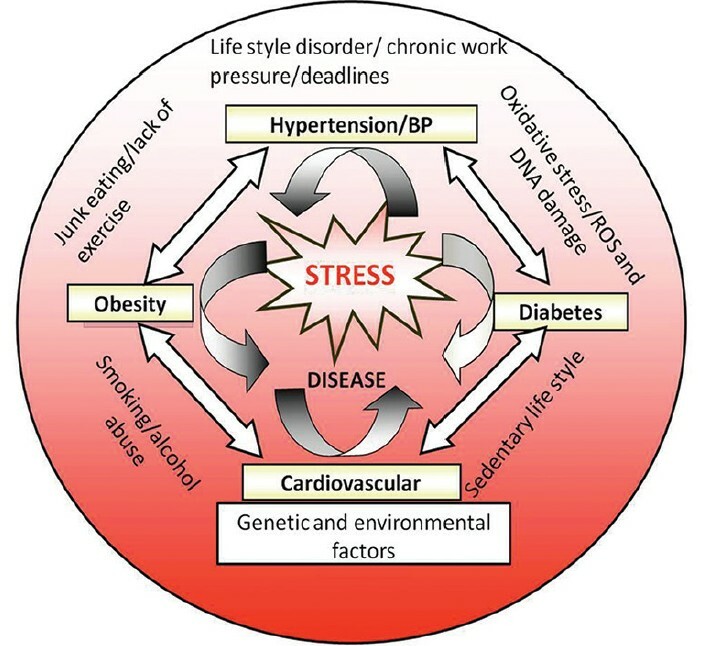 The genes retrieved from the PolySearch database source involved in these four chronic stress-related lifestyle diseases were prioritized based on a z score > 1. In order to exclude outcomes due to chance, the genes having positive z scores ( > 1) were considered. The results showed 51, 82, 70, and 71 genes involved in CVDs, HTN, obesity, and T2D, respectively, on the basis of their z scores. A list of 141 genes was analyzed by FunDO, out of which 131 genes were found to be associated with the diseases. It was observed that these enriched genes were involved in diabetes mellitus; obesity; HTN; atherosclerosis, which is one of the primary reasons of CVD; and anorexia nervosa, which is associated with obesity [Figure 1]. The sizes of the disease nodes are proportional to the number of edges. The numbers of genes involved in these top five diseases are shown in [Table 1]. PPIs are the physical contacts established between two or more proteins due to biochemical events. In our study, the generation of PPI networks with the retrieved genes resulted in 130 interactions among 26 nodes for genes involved in CVD, 142 interactions among 42 nodes for HTN, 160 interactions among 36 nodes for obesity, and 204 interactions among 39 nodes for T2D [Figure 2]. The PPI network obtained from STRING 9.1 for each individual stress-related lifestyle disease was further analyzed as described in the Materials and Methods section. Here, each gene was represented as a node. Two topological parameters, that is, node degree and BC were used for identification of key genes. The gene with high node degree and high BC value represented the key gene involved in a particular disease. The selection criteria of node degree ≥ 5 and BC ≥ 0.05 were used for identification of key genes involved in these four chronic stress-related lifestyle diseases. In this study, as we have considered five diseases, a node degree ≥ 5 was taken as the cut-off value. In case of BC, a minimum value of ≥ 0.05 was considered for its effective significance in screening the optimum number of genes associated with five diseases. Moreover, a higher BC value would have led to the minimum criteria of gene association. The key genes having a node degree ≥ 5 and BC ≥ 0.05 for each individual disease are represented in [Table 2]. 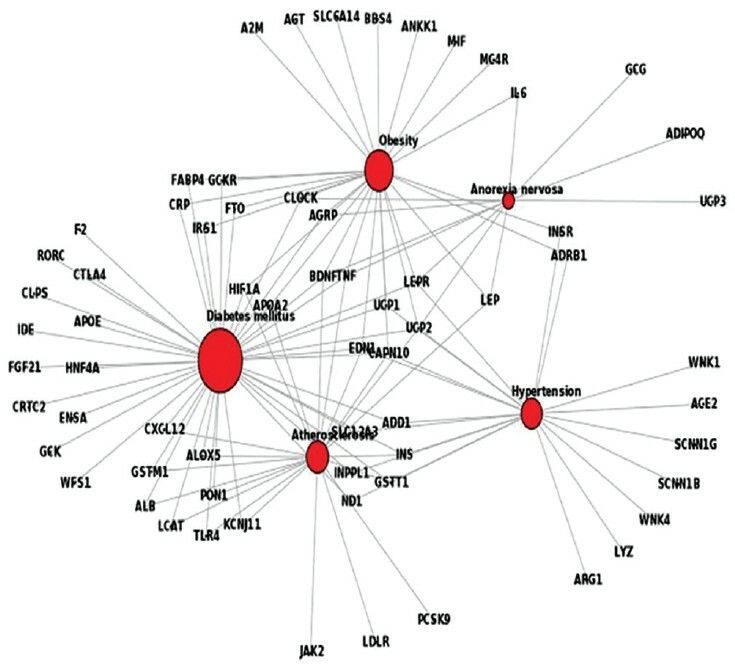 The networks of key genes for each disease were visualized in "Network Analyzer." Nodes having high degree were displayed as big circles, while shades of red to green colors represented high to low BC values for the node. 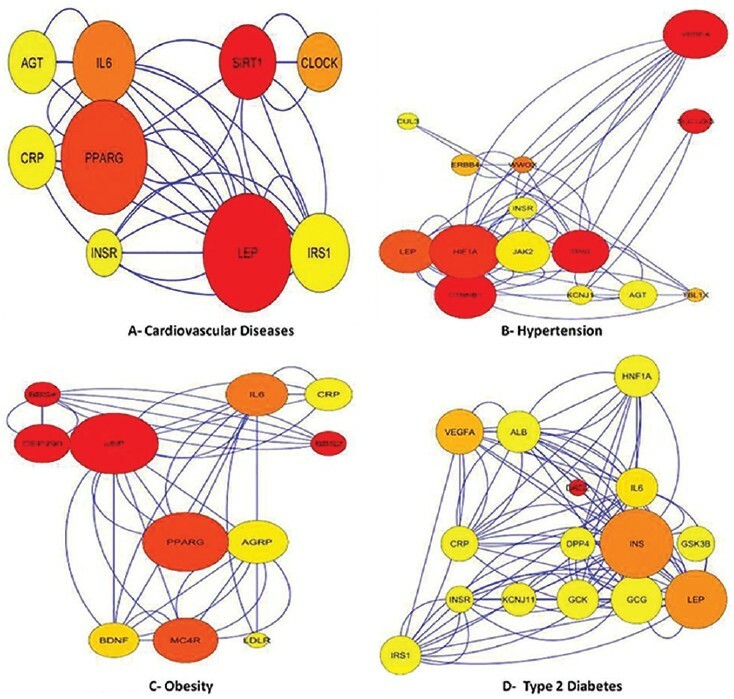 The networks of key genes involved in these stress-related lifestyle diseases are shown in [Figure 3]. After functional enrichment of the genes, it was observed that these genes are involved in insulin signaling pathways, adipocytokine signaling pathways, glucose homeostasis of the body, the sleep-wakefulness cycle, fat cell differentiation, DNA damage response, PI3K/AKT-mediated signaling pathways, regulation of insulin hormone secretion, tissue homeostasis, the circadian clock, regulation of stem cell proliferation, glycogen metabolism, regulation of lipid biosynthesis process, lipid metabolism, several cancers, etc. [Figure 4]. The enriched or key genes obtained based on the selection criteria (node degree ≥ 5 and BC ≥ 0.05) were annotated by using FunDO. Thirty-six genes were analyzed by the web version of FunDO. It was observed that these enriched genes are involved in diabetes mellitus, obesity, hyperinsulinism, metabolic disease, hyperglycemia, and atherosclerosis, which is one of the primary CVDs [Figure 5]. The sizes of the disease nodes are proportional to the number of edges. The number of genes involved in these diseases was shown in [Table 3]. 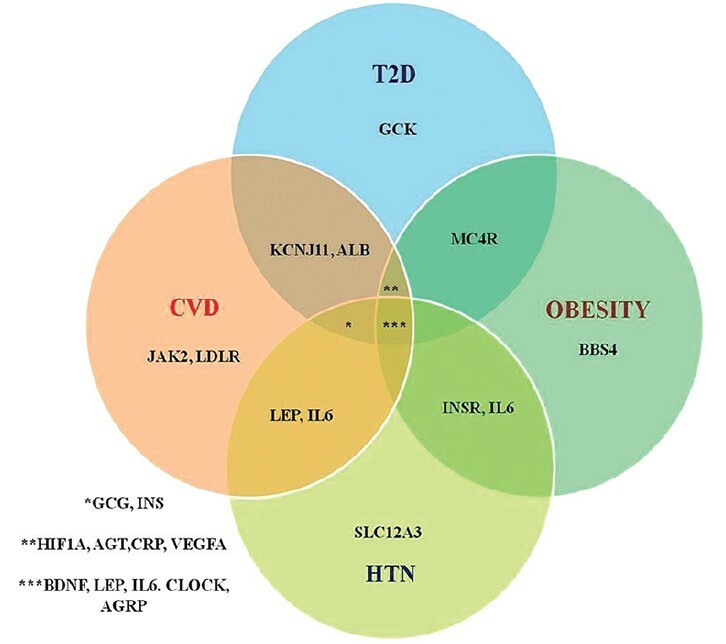 In our study, with the help of published database searching and other bioinformatics tools, we have derived key genes involved in the four chronic stress-related lifestyle diseases CVD, obesity, T2D, and HTN, which are known to be interlinked in pathophysiological terms. After database mining for each disease, we considered the genes having a z score > 1 for each disease, and then by topological analysis we considered the enriched genes involved in each disease, on the basis of node degree ≥ 5 and BC ≥ 0.05. Functional gene enrichment of the diseases, showed involvement of common pathways and biological functions. The schematic representation of the interconnectedness of these diseases, along with the genes involved, is given in [Figure 6]. We have considered common genes based on their interconnectedness and biological involvement in all the four lifestyle disorders mentioned. The figure shows that IL6, LEP, CLOCK, AGRP, and BDNF were the key genes involved in all these stress-related lifestyle diseases. Another key gene, CLOCK (Circadian Locomotor Output Cycles Kaput), having node degree 10 and BC 0.15666667 [Table 2], was obtained from our study that also plays an important role in maintaining the circadian rhythm of our body. The circadian clocks are transcriptionally regulated cell-autonomous molecular mechanisms that directly regulate cellular and biological function at multiple sequential levels: Daily, seasonal, and throughout the lifespan. A cell-autonomous circadian clock allows the anticipation of changes in extracellular or environmental stimuli. This mechanism enables the cell/organ/organism to react to a stimulus with appropriate timing and response. Hence, impairment of the clock mechanism may result in responses to extracellular cues outside of the normal physiological range. The circadian clock regulates heart rate, glycogen metabolism, and triglyceride levels, as well as adapting the responsiveness of the myocardium to extracellular stimuli, such as fatty acids and ß-adrenergic signaling. In multiple animal models of CVD, these mechanisms have been altered and are said to modulate the severity of myocardial damage in response to stresses. It has been considered that dyssynchrony of the cardiomyocyte circadian clock in shift workers, as well as individuals with diabetes and obesity, may lead to cardiovascular complications. It was observed from network analysis that the common driver genes involved in all four diseases under discussion have identical node degree and BC values for each of these diseases. It reflects that these genes have common interacting partners, and the interconnectedness of the genes. It signifies the fact that there is a set of common genes responsible for the generation of these lifestyle diseases due to chronic lifestyle stress in the form of sleep deprivation, abdominal fat accumulation, dietary irregularity, heightened awareness, and spikes of hypertensive episodes. Network analysis can serve as a powerful tool for gene prioritization. Hence, using the network analysis approach in our study we obtained five key genes that play significant roles in disease development due to stress-related lifestyle patterns and behaviors. Studies on the human disease network indicate a common genetic origin for many diseases, hence suggesting the interconnectedness of the genes. Among the key genes obtained from our study, most are involved in maintaining homeostasis of the body. The homeostasis of the body is primarily influenced by lifestyle. Therefore it is imperative that we study the genome as a whole. The purpose of our study was to find out the common driver genes, abnormalities in which lead to a disease condition. A schematic diagram is presented in [Figure 7] in order to show the causative agents that lead to these disease conditions among people. It is evident that lack of exercise, a sedentary lifestyle, consumption of tobacco, consumption of alcohol, work pressure, exposure to mutagens, and the environment work in synergy in the development of stress-related lifestyle disorders. Hence, gaining deeper knowledge of the genes involved as well as their pathophysiological relevance to the disease will enable us to take the necessary preventive measures. The experimental validation of all the candidate genes is not a feasible proposition, due to the high costs involved; getting biological samples from apparently healthy individuals is challenging, as well. It has been used not only to visualize complex interactions among the individual components, but also to comprehend their relative importance in the network based on well-defined topological parameters. In our study, by database mining and using a network-based functional annotation approach, we have derived the primary set of genes associated with chronic stress-related lifestyle disorders and their involvement in the key pathways and biological processes by functional enrichment analysis. Such visualization and identification can promote better understanding of the underlying disease process and also identify specific gene targets for therapy. Nonetheless, additional studies are required to confirm these initial findings so that their true potential may eventually be realized in a clinical setting. We would like to acknowledge extramural funding from the Department of Biotechnology (DBT), Govt. of India. Epel ES. Psychological and metabolic stress: A recipe for accelerated cellular aging? Hormones (Athens) 2009;8:7-22. Banerjee B, Hande MP. Age-independent telomere shortening and ion-channel defects in SCD. Nat Rev Cardiol 2013;10:362. Taylor AE, Ebrahim S, Ben-Shlomo Y, Martin RM, Whincup PH, Yarnell JW, et al. Comparison of the associations of body mass index and measures of central adiposity and fat mass with coronary heart disease, diabetes, and all-cause mortality: A study using data from 4 UK cohorts. Am J Clin Nutr 2010;91:547-56. Egger G, Dixon J. Beyond obesity and lifestyle: A review of 21 st century chronic disease determinants. Biomed Res Int 2014;2014:731685. Herder C, Karakas M, Koenig W. Biomarkers for the prediction of type 2 diabetes and cardiovascular disease. Clin Pharmacol Ther 2011;90:52-66. Radha V, Mohan V. Genetic predisposition to type 2 diabetes among Asian Indians. Indian J Med Res 2007;125:259-74. Raji A, Seely EW, Arky RA, Simonson DC. Body fat distribution and insulin resistance in healthy Asian Indians and Caucasians. J Clin Endocrinol Metab 2001;86:5366-71. Abate N, Garg A, Peshock RM, Stray-Gundersen J, Grundy SM. Relationships of generalized and regional adiposity to insulin sensitivity in men. J Clin Invest 1995;96:88-98. Tanira MO, Al Balushi KA. Genetic variations related to hypertension: A review. J Hum Hypertens 2005;19:7-19. Lifton RP. Molecular genetics of human blood pressure variation. Science 1996;272:676-80. Lim J, Hao T, Shaw C, Patel AJ, Szabó G, Rual JF, et al. A protein-protein interaction network for human inherited ataxias and disorders of Purkinje cell degeneration. Cell 2006;125:801-14. Emilsson V, Thorleifsson G, Zhang B, Leonardson AS, Zink F, Zhu J, et al. Genetics of gene expression and its effect on disease. Nature 2008;452:423-8. Schadt EE. Molecular networks as sensors and drivers of common human diseases. Nature 2009;461:218-23. Perez-Iratxeta C, Bork P, Andrade MA. Association of genes to genetically inherited diseases using data mining. Nat Genet 2002;31:316-9. Turner FS, Clutterbuck DR, Semple CA. POCUS: Mining genomic sequence annotation to predict disease genes. Genome Biol 2003;4:R75. López-Bigas N, Ouzounis CA. Genome-wide identification of genes likely to be involved in human genetic disease. Nucleic Acids Res 2004;32:3108-14. Tiffin N, Kelso JF, Powell AR, Pan H, Bajic VB, Hide WA. Integration of text- and data-mining using ontologies successfully selects disease gene candidates. Nucleic Acids Res 2005;33:1544-52. Adie EA, Adams RR, Evans KL, Porteous DJ, Pickard BS. Speeding disease gene discovery by sequence based candidate prioritization. BMC Bioinformatics 2005;6:55. Aerts S, Lambrechts D, Maity S, Van Loo P, Coessens B, De Smet F, et al. Gene prioritization through genomic data fusion. Nat Biotechnol 2006;24:537-44. McKusick VA. Mendelian inheritance in man and its online version, OMIM. Am J Hum Genet 2007;80:588-604. Wu X, Jiang R, Zhang MQ, Li S. Network-based global inference of human disease genes. Mol Syst Biol 2008;4:189. Lage K, Karlberg EO, Størling ZM, Olason PI, Pedersen AG, Rigina O, et al. A human phenome-interactome network of protein complexes implicated in genetic disorders. Nat Biotechnol 2007;25:309-16. Galhardo M, Sinkkonen L, Berninger P, Lin J, Sauter T, Heinäniemi M. Integrated analysis of transcript-level regulation of metabolism reveals disease-relevant nodes of the human metabolic network. Nucleic Acids Res 2014;42:1474-96. Valcárcel B, Ebbels TM, Kangas AJ, Soininen P, Elliot P, Ala-Korpela M, et al. 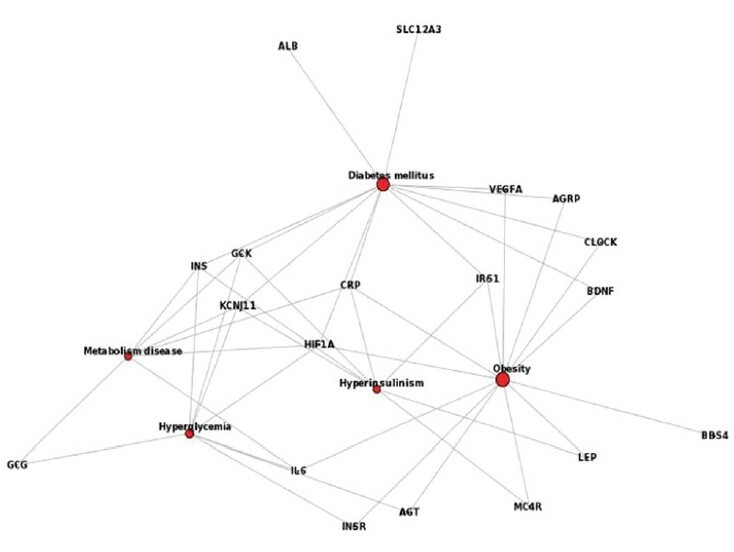 Genome metabolome integrated network analysis to uncover connections between genetic variants and complex traits: An application to obesity. J R Soc Interface 2014;11:20130908. Freudenberg J, Propping P. A similarity-based method for genome-wide prediction of disease-relevant human genes. Bioinformatics 2002;18 (Suppl 2):S110-5. Cheng D, Knox C, Young N, Stothard P, Damaraju S, Wishart DS. PolySearch: A web-based text mining system for extracting relationships between human diseases, genes, mutations, drugs and metabolites. Nucleic Acids Res 2008;36:W399-405. Snel B, Lehmann G, Bork P, Huynen MA. STRING: A web-server to retrieve and display the repeatedly occurring neighbourhood of a gene. Nucleic Acids Res 2000;28:3442-4. Saito R, Smoot ME, Ono K, Ruscheinski J, Wang PL, Lotia S, et al. A travel guide to cytoscape plugins. Nat Methods 2012;9:1069-76. Hotamisligil GS, Shargill NS, Spiegelman BM. Adipose expression of tumor necrosis factor-alpha: Direct role in obesity-linked insulin resistance. Science 1993;259:87-91. Libby P. Inflammatory mechanisms: The molecular basis of inflammation and disease. Nutr Rev 2007;65:S140-6. Gregor MF, Hotamisligil GS. Inflammatory mechanisms in obesity. Annu Rev Immunol 2011;29:415-45. Whelton SP, Narla V, Blaha MJ, Nasir K, Blumenthal RS, Jenny NS, et al. Association between resting heart rate and inflammatory biomarkers (high-sensitivity C-reactive protein, interleukin-6, and fibrinogen) (from the Multi-Ethnic Study of Atherosclerosis). Am J Cardiol 2014;113:644-9. Finn AV, Nakano M, Narula J, Kolodgie FD, Virmani R. Concept of vulnerable/unstable plaque. Arterioscler Thromb Vasc Biol 2010;30:1282-92. Ross R. Atherosclerosis - An inflammatory disease. N Engl J Med 1999;340:115-26. Huth C, Heid IM, Vollmert C, Gieger C, Grallert H, Wolford JK, et al. IL6 gene promoter polymorphisms and type 2 diabetes: Joint analysis of individual participants' data from 21 studies. Diabetes 2006;55:2915-21. Modan M, Halkin H, Almog S, Lusky A, Eshkol A, Shefi M, et al. Hyperinsulinemia. A link between hypertension obesity and glucose intolerance. J Clin Invest 1985;75:809-17. Chen AS, Marsh DJ, Trumbauer ME, Frazier EG, Guan XM, Yu H, et al. Inactivation of the mouse melanocortin-3 receptor results in increased fat mass and reduced lean body mass. Nat Genet 2000;26:97-102. Haskell-Luevano C, Cone RD, Monck EK, Wan YP. Structure activity studies of the melanocortin-4 receptor by in vitro mutagenesis: Identification of agouti-related protein (AGRP), melanocortin agonist and synthetic peptide antagonist interaction determinants. Biochemistry 2001;40:6164-79. Havel PJ. Role of adipose tissue in body-weight regulation: Mechanisms regulating leptin production and energy balance. Proc Nutr Soc 2000;59:359-71. Porreca E, Di Febbo C, Pintor S, Baccante G, Gatta V, Moretta V, et al. Microsatellite polymorphism of the human leptin gene (LEP) and risk of cardiovascular disease. Int J Obes (Lond) 2006;30:209-13. Wallace AM, McMahon AD, Packard CJ, Kelly A, Shepherd J, GawA, et al. Plasma leptin and the risk of cardiovascular disease in the west of Scotland coronary prevention study (WOSCOPS). Circulation 2001;104:3052-6. Chen ZY, Jing D, Bath KG, Ieraci A, Khan T, Siao CJ, et al. Genetic variant BDNF (Val66Met) polymorphism alters anxiety-related behavior. Science 2006;314:140-3. Wynne K, Stanley S, McGowan B, Bloom S. Appetite control. J Endocrinol 2005;184:291-318. Edery I. Circadian rhythms in a nutshell. Physiol Genomics 2000;3: 59-74. Wilsbacher LD, Takahashi JS. Circadian rhythms: Molecular basis of the clock. Curr Opin Genet Dev 1998;8:595-602. Durgan DJ, Young ME. The cardiomyocyte circadian clock: Emerging roles in health and disease. Circ Res 2010;106:647-58. Härmä MI, Ilmarinen JE. Towards the 24-hour society - new approaches for aging shift workers? Scand J Work Environ Health 1999;25:610-5. Lee K, Song YM, Sung J. Genetic and environmental associations between C-reactive protein and components of the metabolic syndrome. Metab Syndr Relat Disord 2013;11:136-42. Kranz A, Rau C, Kochs M, Waltenberger J. Elevation of vascular endothelial growth factor-A serum levels following acute myocardial infarction. Evidence for its origin and functional significance. J Mol Cell Cardiol 2000;32:65-72. Huang Y, Lei L, Liu D, Jovin I, Russell R, Johnson RS, et al. Normal glucose uptake in the brain and heart requires an endothelial cell-specific HIF-1á-dependent function. Proc Natl Acad Sci U S A 2012;109:17478-83. Al-Najai M, Muiya P, Tahir AI, Elhawari S, Gueco D, Andres E, et al. Association of the angiotensinogen gene polymorphism with atherosclerosis and its risk traits in the Saudi population. BMC Cardiovasc Disord 2013;13:17. Goh KI, Cusick ME, Valle D, Childs B, Vidal M, Barabási AL. The human disease network. Proc Natl Acad Sci U S A 2007;104:8685-90.